We love celebrating the 4th at home, just hanging out with our extended family, so this year, we're hosting. I'm decking our deck (ha!) with some subtle red-white-and-blue decor. Hydrangeas are perfection for Independence Day (in season + naturally blue = worthy of the 4th). No need to go over the top with stars and stripes - especially for a mostly grownup guest list. Since it gets a little chilly here when the sun starts to set, I'll have a few throws handy for anyone who feels the need to snuggle in a bit while we wait for the fireworks to start. Now for the important stuff - the food! 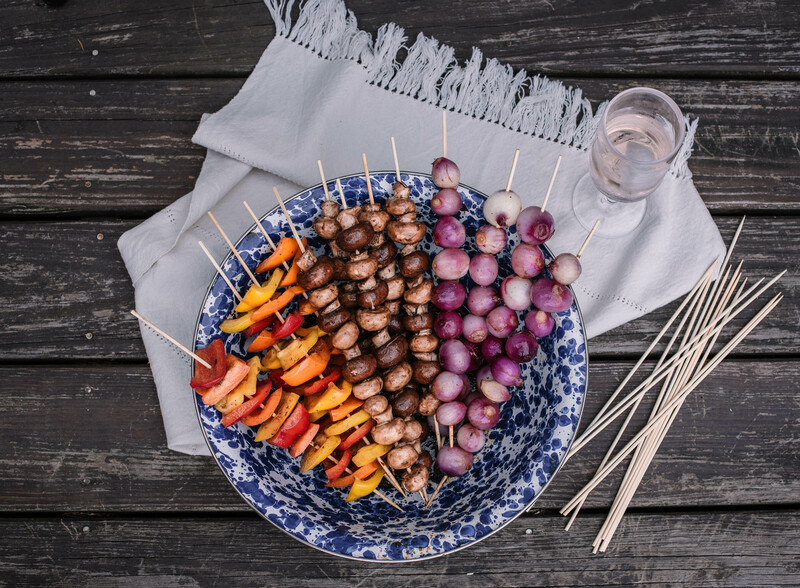 Around here, shish kebabs are our go-to for casual summer entertaining because they're super easy... and let's face it - they look really impressive! We like to put all the same meats and all the same vegetables on the skewers as opposed to the usual method of alternating meat with a variety of veggies on each. We find it's just easier to cook them that way (fewer pieces fall off their skewers) and the items that cook faster can simply be pulled off the grill when they're done. That way, nothing chars and nothing cooks to the point of mushiness. You can pick basically any combination of beef, pork, or chicken and any veggies that will stand up to being skewered and grilled. This time around, we're using baby onions, assorted colored peppers, button mushrooms and chicken. Here's the recipe. Our "secret sauce" for the best kebabs is marinating them in what's basically a balsamic vinaigrette. We usually make ours from scratch, but we sometimes opt to make things even faster and easier by using Newman’s Own Balsamic Vinaigrette bottled salad dressing instead. Here's the recipe for our chicken version. Separate chicken and vegetables into large Ziploc bags (1 bag for chicken, 1 for onions, 1 for peppers, 1 for mushrooms). Divide marinade between the bags, seal, and let sit in the refrigerator overnight. When ready to grill, place chicken and veggies on skewers, again keeping ingredients separate since they will all cook at different rates. Cook skewers on hot grill, making sure to remove veggies before they get mushy and cooking chicken until no longer pink when cut into. For an even faster version, you can skip the marinade ingredients and use Newman's Own Balsamic Vinaigrette salad dressing instead. We'll be pairing the kebabs with wild rice, a simple tomato and cucumber salad, and a beautiful dry white wine. Yum! But all of that is just the lead up to dessert, right?! I have to say, though, that I cringe a little whenever I search for 4th of July desserts online. Is it just me or do you feel a little nauseous just thinking about all of that red and blue food coloring?!?! Instead, we're going for a simple strawberry shortcake. I'm not talking about dumping a container of bright red goo with a few strawberries mixed in onto those packaged things that look more like cleaning sponges than cake. I'm pretty sure that version of shortcake would make our forefathers very, very sad. Nope! We'll be using freshly picked strawberries atop beautifully imperfect, homemade biscuits and lightly sweetened fresh whipped cream. That said, there's been a little biscuit drama. I feel like every Southerner knows exactly how to make amazing, flaky biscuits. Maybe it's the climate. Maybe it's all about secret family recipes. But up here in the North, we just don't really know how to accomplish a truly great biscuit. And I for one am unwilling to settle for a subpar biscuit - especially in my 4th of July dessert! And so we went on a hunt around town to see if we could find a readymade version we liked. The closest thing we found were Wegmans Buttermilk Biscuits, which are actually amazing. But they're a bit expensive at $5.00 for 4 (!) and we need at least a baker's dozen. That led us on a quest to unearth the absolute best biscuit recipe. We ended up trying just 3 different recipes. The first one bombed. I guess you could say they were perfectly light and fluffy... if by "light and fluffy" you mean stone-like! I don't think it was the recipe at all. I think I screwed them up by overworking the dough. Biscuits are one of those unforgiving kinds of foods where you pretty much have to hold your mouth right and stand on one foot while you make them or they won't turn out right. But I really wasn't into that recipe enough to take another stab at it. My stepbrother suggested Alton Brown's version, which really did turn out so light and fluffy and beautiful! They were awesome. Even so, hands down, we found that Tieghan’s recipe from Half Baked Harvest tasted the best. They had that perfect buttery flavor with all the light and fluffy goodness our little hearts desire! If you don't yet follow Tieghan, you should. Her recipes are consistently some of my favorites. I believe these biscuits will make a shortcake our forefathers would be proud of. But regardless, we're going to enjoy every last crumb. What will you and yours be eating on the 4th? No judgement if it has food coloring in it, as long as you love it! Here's hoping your Independence Day celebration is totally delicious and delightful!